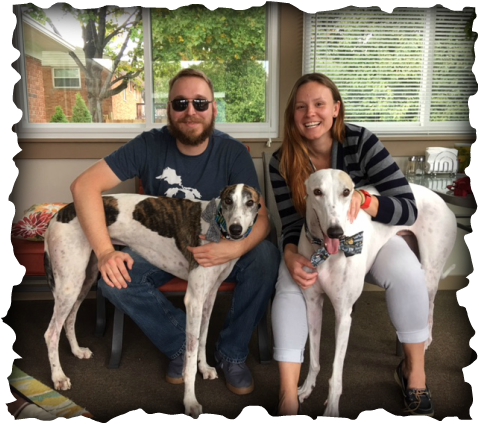 A Fly Rod Carew came to town on Oct 1st from Alabama, Nate and Andrea who have fostered at least 11 hounds for us took this boy to foster, he was a puller and needed to learn how to walk properly. Well when I asked for an update on (nickname Torpedo) Andrea informed me he was HOME already! They lives in Villa Hill, KY. Rusty and Torpedo do so well together, both gorgeous laid back boys. Piper (not pictured) is their daughter and Torpedo loves her too. This family has been a GAGC family for over a year and is a supporter of our mission in finding good homes for these amazing dogs. AND they said they'd foster again next year after getting Torpedo settled in.